Here’s another wonderful update on one of our adoptions. 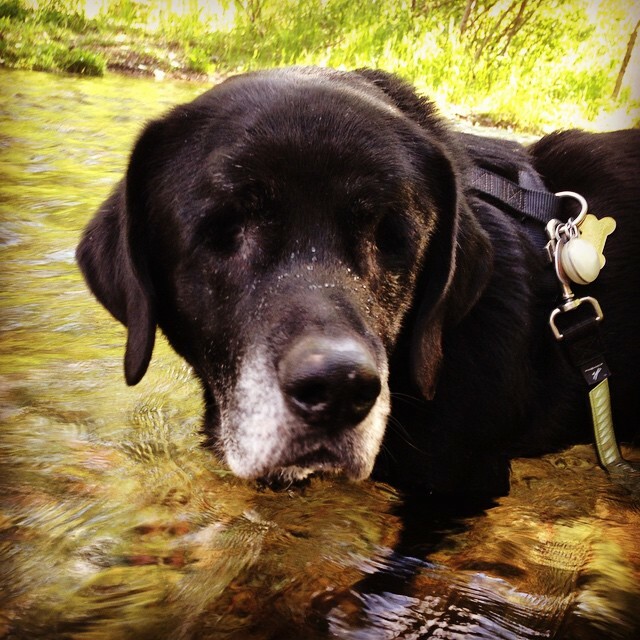 Kate W. was a long-time and dedicated volunteer when we were at the ranch in Montana, and it was there she met and adopted a blind Lab named Luke. Kate has periodically sent us reports on Luke, and with Kate’s permission, I wanted to share some excerpts from this incredibly sweet and heartwarming one with you. She took that photo above of Luke the day before his 12th birthday. Time for our yearly Lucas McCoy update! Luke has had another great year with only a few old man health issues but he is aging wonderfully and I couldn’t be more grateful for his health! He has some arthritis and has slowed way down but is still going on his daily walks through the park, although the distance we travel seems much shorter today than a few years ago. He continues to enjoy meeting other dogs and people (especially people with snacks) and we are often stopped by folks in the park who are curious or just want to cheer Luke on. He remains a great example of how a blind dog can live an amazing, full life. The night before his 12th “Birthday” and our 8 year adoption anniversary I couldn’t help but think about all of our memories over the past 8 years, it was almost as if Luke’s life had flashed before my eyes. I cried a little as I looked into his face and stroked his fur. Always wishing we had more time, more time together here. I know his journey here on earth is winding down, slowing down, at just the right pace, just as it should be and I am so thankful to have spent this time with him. He has taught me so much: patience, responsibility, how to appreciate the quiet moments, the challenging moments and that my heart is so much bigger than I ever thought it could be. He has taught me more than I could possibly know now but will probably realize and reflect on years from now. I thank you both for the animals you save, care for and comfort and the message you send to people around the country, advocating for animals with disabilities. And I thank you from the bottom of my heart for connecting me with this beautiful soul we call Luke. Luke looks like a terrific dog. I love senior dogs and Luke looks wonderful with his gray muzzle. Seems like that adoption benefited everyone involved. Wishing Luke many more happy years. And thank you Kate for taking such good care of him and giving him a wonderful life. What a lovely note. Thank you and Kate for sharing. This is such a sweet & touching update about Luke. It must reinforce your commitment knowing the work you do makes such a difference. And, to see one of your own living such a great life. Thank you for sharing. Such a sweet story! Luke is very blessed, as is Kate. Two sweet souls connected. How beautiful is that! Happy Birthday/Anniversary, Luke! A wonderful story! I love the update. It is so heartwarming that people don’t get stressed and dump older dogs. Our Buddy is getting up there and his first 5 years on the end of a chain have added to his health issues but it is satisfying to help him deal with getting older. I’m sure this wonderful adopting family feels the same way. This reminded me of another Luke update that included a photo that I just love! Such beautiful thoughts. Happy Birthday Luke! How lucky Luke was to find this beautiful human being who truly appreciated him ! Such a touching update. I so enjoy reading her letter excerpts and knowing that she and Luke have such an incredible bond. Thank you for sharing! Seems there is no better tribute to your work than to see one of your gang loved, thriving and showing folks how wonderful a dog with special abilities can be. I know we all wish that for all dogs, and thank you all for your kindness. There is something so extra special about a sweet, older dog, as you come to appreciate them more each day. Luke appears to be most special. Virtual hugs to you Luke! Happy Birthday Luke! I remember when Kate adopted Luke back in ’07. I’m touched to read all that Kate has learned from Luke….patience, responsibility, love…. thank you so much for sharing Lucas story…and for giving him such a loving, full life (he reminds me of our former black lab Faulkner who graced our lives for 14 years 🙂 We now have an adopted blind cat Martha Skylight (so named because the sky is the limit with what she can do, her scenting ability is unmatched and she loves everyone). She is a wonderful companion and she “sees” far better than I with all her other senses. She is one awesome cat. again thank you fro sharing Luke’s story. I’m so glad you soul mates found one another. Bless you. I have been following your journey since you adopted Luke in Mt. What a lovely tribute to your wonderful companion. Best of health to all of you. Good to see Luke to plugging along! They get around so well, you almost forget they are blind. I agree with everything you said of what you have learned from Luke…I felt the same with Levi!! I never thought I could love a dog as much as I loved him!! He was my boy!! Sadly I lost Levi quite suddenly a couple of weeks ago. (I think it was a heart attack) I wasn’t sure how old he was, maybe 13?? He was such a presence in the house, it is very strange not having him around! Enjoy your remaining time with Luke!!! I hope it will go for many years to come! !